Beacon Ridge is on the auction block. Golf course broker Hilda W. Allen has the 18 hole course, clubhouse, and other amenities listed on her website with a bid deadline of Thursday, February 4. Current club owner Don Billings told The Times that he hopes to have a deal closed by March 1, in plenty of time for the new owners to capitalize on the Spring season. Billings notified the membership of the possible sale in a letter on Tuesday, December 8. Billings and his wife Rhonda came out of retirement to run the club in 2013, after terminating a lease with Wingfield Properties, which had operated it for the past sixteen years. In his letter, Billings noted that Wingfield was not meeting the terms of the lease and was "continuing to let the club deteriorate." Since then, the Billing's company, Beacon Ridge Investment Group, has made substantial upgrades, including remodeling portions of the clubhouse; adding a fitness center; reopening the pool; which had been closed by the county Health Department; and bringing on longtime Foxfire Golf manager Howard Cannon to manage day-to-day operations. Those efforts were dealt a bit of a setback this past Summer, when over-fertilization severely damaged a number of greens. They have since been resodded with bent grass and are well on the way to recovery, Billings said. The improvements helped reverse a decline in membership. Billings told The Times that the club currently has just under 200 memberships, with the majority of those including couples or families. "We just felt like we had made an investment in having substantially rehabbed the club, and it holding its own for a couple of years," he said, "but realized that we didn't want to continue with the task of rebuilding it up." In his letter to the membership, Billings wrote, "Given our ages, it is time for us to retire again." Billings is 81. The club will continue to operate with no changes as the auction process proceeds. Billings told members that any dues prepaid for 2016 will be held in escrow and withdrawn on a monthly basis until closing, when they will be disbursed to the new owners, who will continue to honor memberships. Moore County's Board of Commissioners is ready to fund the construction of four new schools — those at the top of the Schools Board's revised Master Facilities Plan. That was the clear message from two meetings the Commissioners held on Tuesday, October 20: a Work Session to look at the options for financing school construction and a joint meeting with the School Board to hear about the revised priority list. "I think our visions marry up very well," Chairman Nick Picerno said at the conclusion of those meetings. "By having these joint meetings, I think we have shown something that should be a model for every county across our state," Picerno said. "Get in a room, lay it on the table, say the pros and cons, show where you disagree, try to work to a middle, and get things done." The meeting began with a review of facilities decisions the Board of Education made during their October 12 meeting, rearranging the previously approved Master Facilities Plan to give top priority to the construction of the Advanced Career Center [ACC], near Sandhills Community College, and the next three spots in the priority list to three new elementary schools. The Commissioners appeared particularly impressed by a presentation of the proposed ACC curriculum by the three current principals of Moore County's high schools. North Moore Principal Jenny Purvis said, "We want to make sure that, if we build this, we are going to have students there." So the principals pulled together actual course requests submitted by students last year and compared those with the current offerings at the three high schools. "We decided to focus on those areas where we have large overcrowding," Purvis said, "where we just can't serve the number of students who are requesting the course." An example would be nursing, where state law severely limits the number of students in the classroom, and the high schools can't meet the demand from students. They also highlighted situations in which students requested a course — but not enough students to make it feasible to offer that course on an existing campus. An example would be advanced auto technology courses, where there are not enough students on any one campus to warrant offering the courses, but combining all those requests at the ACC would allow those students to be served. For the principals, the process means losing some courses on their home campuses, while gaining other advantages. "I lose a lot of courses," Pinecrest Principal Bob Christina said. "But we are sharing, because we care about all the kids in Moore County." He mentioned specifically the possibility of losing the ROTC program, which could become a part of the Global Leadership pathway at the ACC. "What does that do for me? That frees up space," he said. "I'm not giving up practice fields for them to drill. I'm not giving up classroom space for four periods. That frees up opportunities for my teachers who don't have classrooms, and have to float, to have their own classroom." "I have had students come up to me everyday," Union Pines Principal Andy McCormick said, "asking about what are the course offerings at the ACC . . . . I think it will be a tremendous opportunity for the students of Moore County — making them shine, making them more competitive across the state and across the country." "Kudos to all of you," Commissioner Graham said. "We need those service jobs. We need those electricians. We need those plumbers. CNAs. They know then that they want that RN, so they don't waste two years and then decide, "Hey, this nursing's not for me.'" "There are a lot of pathways to being successful," Commissioner Randy Saunders said. "I'm for anything we can do to give our kids a competitive advantage. I think this is a game changer for our kids." Will Moore County taxpayers support a quarter-cent sales tax increase to help build new schools? That question will be answered on March 1, when the Presidential Primary ballot will also include an opportunity to vote for or against a "local sales and use tax at the rate of one-quarter percent (0.25%) in addition to all other state and local taxes." If the voters approve, the new tax will add an estimated $2.2 million to County coffers in FY 2017. The Moore County Board of Commissioners unanimously approved, during their regular Tuesday, October 20 meeting, a resolution asking Elections Director Glenda Clendenin to put the question on the March Primary ballot. The referendum question, cannot, by law, include any statement about the intended use of the funds. But the Commissioners have made clear that they intend use most — if not all — of that new revenue to support the building of new schools. The new voter-approved sales tax is allowed under Article 46 of Chapter 105 of the NC General Statutes. Unlike other local sales taxes authorized by the General Statutes, Article 46 taxes are distributed to the county alone, rather than being shared with the municipalities. The tax will not be applied to purchases of groceries or gasoline. State law prohibits the County from advocating for or against the sales tax; however, the County can spend money to educate voters about the referendum. County Manager Wayne Vest said his leadership team would "immediately begin an initiative to educate and inform the voters." Prior to the vote , Chairman Nick Picerno recalled that he was asked, in a candidates forum during his first campaign, whether he would support an increase in the sales tax. He was the lone candidate who said he would not support an increase. "The reason I did not support it at that time was that they had no proven reason for additional revenue. There was no excuse to raise the tax. I think we have shown over and over through our discussions with the School Board and our educational construction needs — and the way we are getting rooked by the tier system not giving us our fair share — that this is the only way that we can supply the revenue we need." On Thursday, October 8, Moore County's new Fire Commission will review the final draft of a funding formula developed to drive budgeting for the County's seventeen fire and rescue departments. The work of the Commission to standardize service across the County has already become controversial, at least in West End and Foxfire Village, as bits and pieces of the funding formula have appeared in the minutes of the Commission. It appears inevitable that the funding model will recommend that the County pay for fewer paid firefighters at West End Fire and Rescue [WEFR] than that department's Board of Directors currently has on staff. Both the WEFR Board and the Village of Foxfire, which is served by the West End department, have expressed concern that a reduction in paid personnel will undermine coverage. The Times met with Fire Commission Chairman Mike Cameron; Rich Lambdin, President of the Moore County Fire Chief's Association; and County Fire Marshal Ken Skipper on Tuesday, September 22 to better understand the rationale behind the Commission's funding formula. Cameron is Chief of Cypress Pointe Fire & Rescue; Lambdin is Chief at Whispering Pines Fire and Rescue. The Board of Commissioners has tabled a request by Moore County Schools [MCS] to use $800,000 in NC Education Lottery funds to purchase the site for a new Aberdeen Elementary School and to pay for due diligence and design fees. The unanimous vote came during the Board’s Tuesday, August 4 meeting. MCS Administration and the Board of Education undertook a lengthy process of identifying and prioritizing the County’s needs for new and expanded school facilities in 2013 and 2014. That process included a projection of student population growth by a research firm affiliated with NC State University, evaluation of existing MCS campuses by Moseley Architects, community meetings and a survey to gather public input, the convening of a task force of community leaders to provide recommendations to the School Board, and significant debate by the School Board itself. 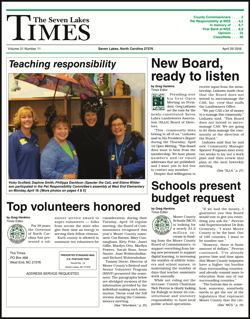 The result was a priority list of ten projects with an estimated total cost of $110 million, including the expansion of Pinecrest and Union Pines High Schools, the construction of a new specialty high school, three new elementary schools, expansions at Pinehurst and West Pine Elementary Schools, renovations at North Moore High School, and a new middle school. What the process did not produce — and the Commissioners want — is a detailed projection of the timing of those projects, and the cash that will be required at each step of the process, so that the County can decide how best to come up with those funds. Parents for Moore plans to welcome the more than one hundred new teachers who will join Moore County Public Schools this Fall with welcome baskets stocked with gift cards and discount coupons for local businesses, small gifts, and even school supplies. The group — formed to lobby for increased funding for public education — is also developing ways to show community support for classroom teachers. Gift baskets will be distributed to new teachers at a welcoming celebration in mid-August. The program will be extended to returning teachers in September. Mondays for Moore - Businesses are encouraged to dedicate a percentage of receipts from the first Monday of each month to supporting public schools. For example, a restaurant might pledge that ten percent of its First Monday sales would go toward the effort. The funds collected will be divided evenly among the County's public schools and routed through the PTA or Principals office at each school. Businesses participating will be recognized in a Parents for Moore directory that will be included in teacher gift baskets. Hafer even hopes to have the directory translated into a smartphone app that teachers and others can use to locate "teacher-friendly businesses." Chili's in Southern Pines has already signed on, and will host a Mondays for Moore event on Monday, August 3. Teacher Discounts - Businesses offering an ongoing discount for teachers will also be listed in the directory. Gift Cards & Coupons - Businesses can donate a supply of gift cards, coupons, or special offers for teachers for use in the gift baskets. Hafer said the group will need 155 of each in order to place one in each new teacher gift basket. Those donations will be recognized in the Parents for Moore directory. Welcome Baskets - Finally, businesses, organizations, or individuals can build their own welcome basket filled with gift cards, gifts, school supplies, and-or various other goodies. Those baskets will be included among those given out to new teachers in mid August. In addition to being listed in the Parents for Moore directory, Hafer said, participating businesses will receive a decal or sticker that can be placed near their cash register, identifying them as a "teacher-friendly" business. Gift cards, coupons, and other smaller items may be mailed to Parents for Moore, PO Box 4764, Pinehurst, NC 28374. Those with larger items or gift baskets can email Hafer to have them picked up. In order to be included in the gift baskets for new teachers, donated items must be received by Thursday, August 6. Ray Sohl has resigned as Community Manager of the Seven Lakes Landowners Association [SLLA] to pursue a career opportunity in California. Sohl announced his resignation during the Thursday, July 23 Work Session of the SLLA Board of Directors. He said he had given notice of his resignation to President Chuck Leach four weeks earlier. Sohl's final day on the job was Friday, July 24. He told The Times that his family would be relocating to the San Francisco area. CAS, Inc., SLLA's management company, will provide an interim manager while the search proceeds for a permanent replacement for Sohl. A notice of the opening is posted on the website of the Community Associations Institute, a national trade group for landowners associations. "I think you will have an easy time filling it," Sohl said of his position. "This is a beautiful community. I have really learned to love it. The lakes and the amenities really make you unique in the state of North Carolina. I'm just really sorry that I can't take this community with me." "I have appreciated my time serving the Board and this community," Sohl said. "I think you have an excellent Board. I think they are representative of the community. It's a tough job, and I want to say how much I appreciate them, and how difficult this decision has been for me." "He has been a dedicated, honest, and loyal Community Manager," President Chuck Leach said of Sohl, "with very few people knowing how much he truly cared for Seven Lakes." "His primary focus has always been on doing what is right, and doing what is in the best interest of this community," Leach said. "Ray can leave Seven Lakes with pride in his accomplishments and the satisfaction of a job well done. As he looks forward to new challenges in California, he has our respect, appreciation, and our very best wishes." The drive for a recall election that would remove Laura Lang from the Moore County’s Board of Education ran aground during the Tuesday, July 21 regular meeting of the Moore County Board of Commissioners. But we may not have heard their last word on the subject. The Commissioners unanimously rejected a resolution that would have added Moore County’s name to a recall bill for the Stanly County Board of Education. A few hours later, Chairman Nick Picerno pledged to put the resolution again before the Board during their August 4 meeting, and to support it at that time. Picerno made that pledge on the Parents for Moore Facebook page, in response to protests from the group’s members. The bill in question, House Bill 111, was filed by Representative Justin Burr of Albemarle, and currently pertains only to the recall of members of the Stanly County School Board. It was approved by the House in a 71-43 vote in March, passed its first reading in the Senate on April 1, and has been shuffled between the Senate Rules Committee and the State and Local Government Committee since. Steven Charles Behre, a 52-year-old resident of Middlesex, NJ, died of apparent drowning at Lake Sequoia Tuesday evening, July 7. Moore County Sheriff's Detective Kathy Williams told The Times that Behre was found in the water near the dock at 122 Overlook Drive by family members, who began CPR. The home is owned by Roger Behre. Mr. Behre and his late wife, Claire, retired to Seven Lakes in 1993. Williams said the emergency call came into the 9-1-1 center at 6:17 pm. Seven Lakes EMS, Seven Lakes Volunteer Fire and Rescue, and West End Fire and Rescue all responded to the scene, taking over efforts to revive Behre. Williams said the incident "looks like a bad accident" but could not speculate on whether the cause of death was drowning or some other medical event. Behre was transported to FirstHealth Moore Regional Hospital. The cause of death will be determined by an autopsy conducted by the Chief Medical Examiner's Office in Raleigh.